Looking for some clever and fun ways to give your office a lift this spring? 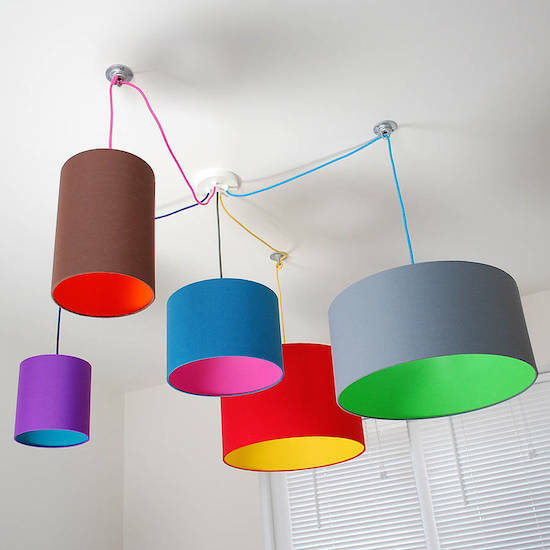 Here are five ideas to help you spruce it up! 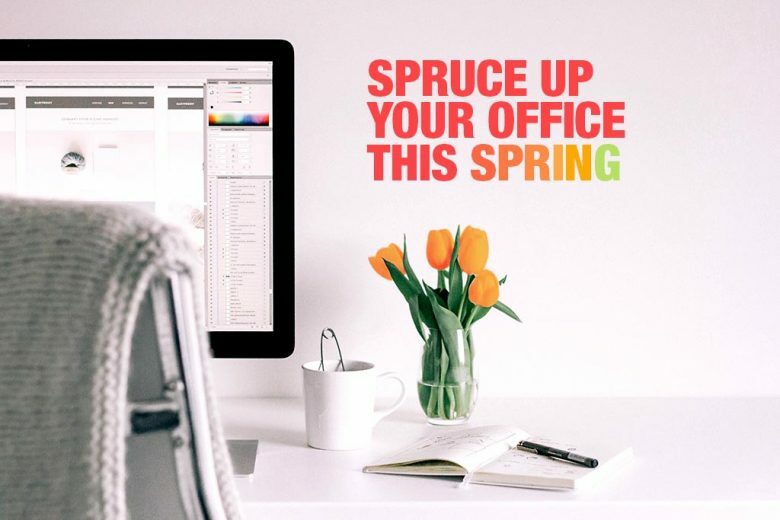 Spring is finally here, and with everyone’s New Year, new me resolutions firmly out the window it couldn’t be a better time to do a little spring cleaning and sprucing around the office to get your team geared up for the warmer days ahead. Here are five things you can do this spring to get that office paperwork under control as well as boost employee morale, health and productivity. Having living plants in the office cleanses the air, dampens sound and humidifies the environment, benefitting each and every employee. Try dotting shade-tolerant and low maintenance plants on random desks and tables to benefit from better indoor air throughout the office. Just be wary of buying plants known for pollen or mould due to allergies; succulents are a great choice because they don’t need much care and don’t produce pollen. 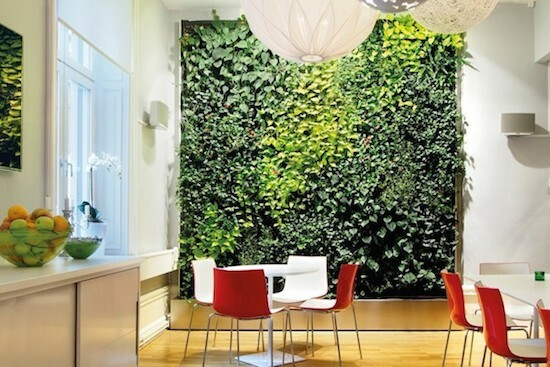 You could even go a step further and install customised living green walls in key areas for a dramatic and uplifting natural feature, a sure-fire way to boost employee health and happiness. Don’t fancy the hassle of caring for a real, living plant? 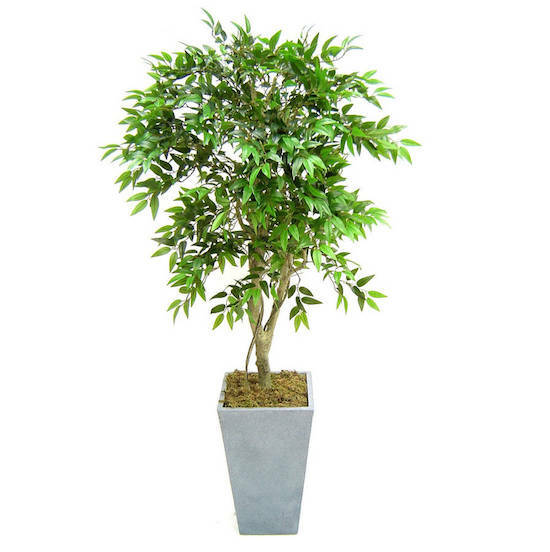 Companies like Fake It Flowers specialise in designing and supplying artificial plants and trees that are so stunning and realistic, you probably won’t notice the difference. You can also browse a selection of beautiful artificial plants for UK delivery from Artificial Landscapes here. Aside from springing for a funky new overhead light fixture, renovating your lighting system can actually reap huge rewards for your business. Lighting that is either too harsh or too dim is harmful to your employees, causing eye strain, migraines and even low productivity. The best solution is to use natural light as much as it’s practically possible, followed by providing the option for variable lighting on both overhead and individual lights so that employees can control their environment. The types of lightbulbs you’ll need will vary greatly on how much natural light your office receives combined with the layout of desks and computer monitors, so be sure to research your business’ needs carefully. 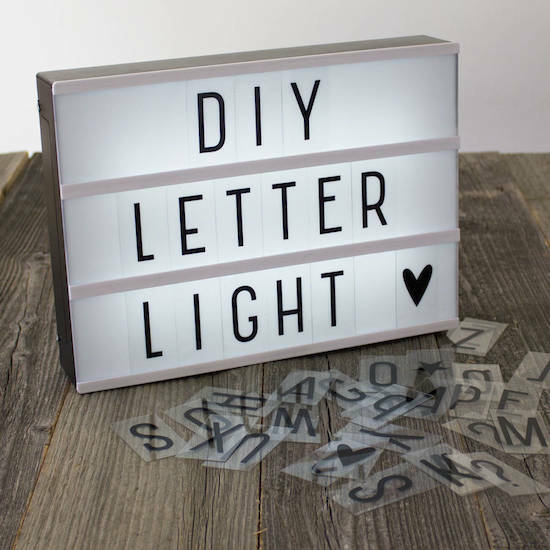 However, by making small lighting changes you’ll not only reduce the occurrence of eye strain and increase productivity and morale, but employees adjusting their own lights and switching them off more often will save your company money on energy bills, too. It would be far too easy to suggest you give the office walls a lick of paint. 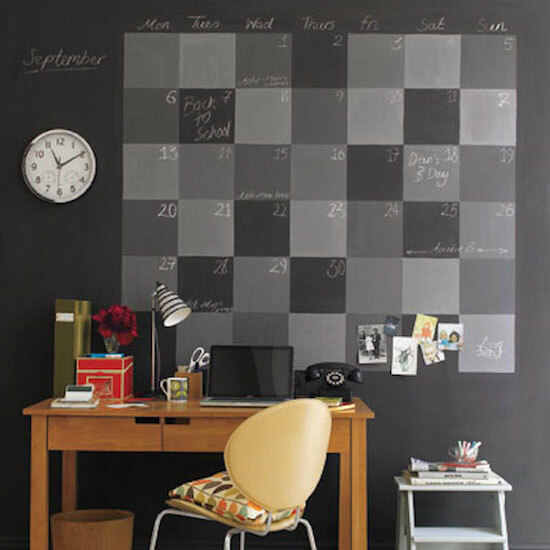 But a lick of chalkboard paint can transform the dullest wall into a giant notepad. From team calendars to sales tallies, ditch the whiteboards and make your walls that little bit more fun to interact with. Or how about some chalkboard table tops for employees to scribble on during brainstorming sessions? If you’re not ready to cover the walls with paint, but are in need of a new doodle pad of some description, try making your own using large photo frames and brightly coloured backing card. Your creations will look more attractive than any standard whiteboard and can be carried from one end of the office to the other when required. If your employees’ desks are piled high with papers and all manner of bags and boxes are surrounding their feet, this can actually negatively affect their ability to focus and process information, according to neuroscientists. But sometimes we genuinely need all the bits and bobs that accumulate over the years even though we’re not using them right now. 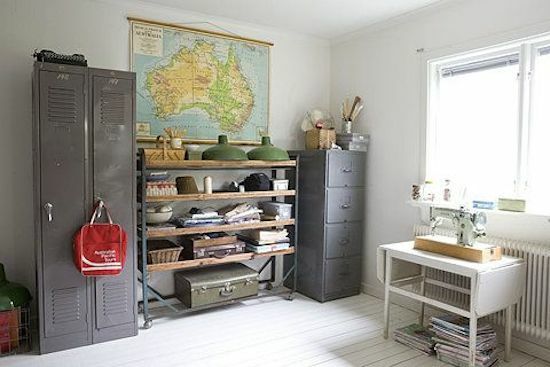 Consider providing attractive new cabinets, lockers and shelving units systems for team members to bung their stuff into and reap the benefits from clear spaces, increased performance and decreased stress. While out of sight may mean out of mind, there are also the bits and pieces we need to use on a daily basis that may be clogging up our desks. 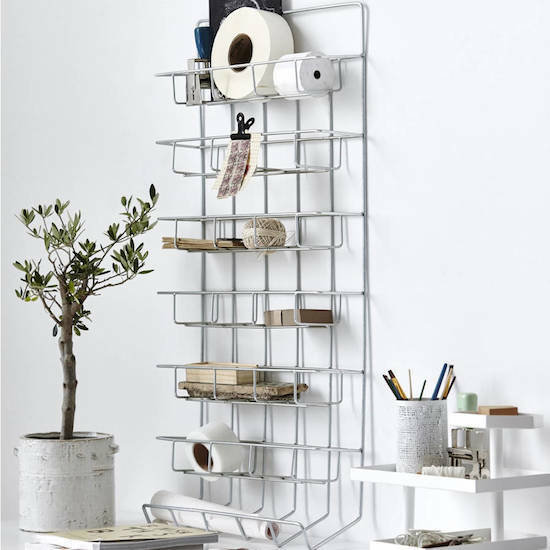 Keep your desk clear with clever desk tidies, or use the vertical space of your walls. Convincing team members to get on board with your company’s recycling programme can be tough, so why not make them a little more fun? Take these guys for example: they are easily identifiable, make it clear which recyclable materials go into which bin and, most of all, make you smile. 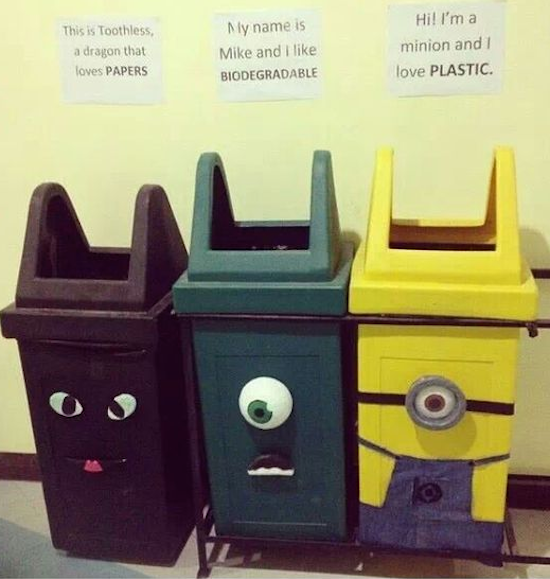 Employees simply can’t forget to recycle when there are cartoon characters involved.